Permanent cosmetics are a makeup technique which uses tattooing as a means of producing designs that resemble makeup. Permanent cosmetics are also referred to as cosmetic tattooing. Common permanent cosmetics include lining of the eyes, lips, eyebrows and more. It is also used to produce artificial eyebrows for those who may have lost them do to disease, cancer treatments or old age. The inks that are used in permanent cosmetics are subject to FDA regulations. The rules and regulations in place for permanent cosmetics vary from state to state, or even city to city so it is important to research the facility you plan to get work done at thoroughly. The costs associated with permanent cosmetics vary greatly. Some permanent cosmetics require very little time and ink, which will cost less. Other permanent cosmetic procedures will cost more because of the detail and amount of work involved. 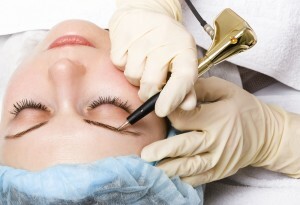 It is important to find a reputable facility and permanent makeup artist to perform your procedure. If you have to spend more to go to a more well-known and trusted facility it is well worth it. Find a facility that is clean and uses sterile instruments. The cost for permanent cosmetics generally ranges from $200 – $1,000 depending on the procedure. Permanent cosmetics are similar to tattooing in many ways, with the exception that most people do not get tattoos on their face. You will meet with the cosmetic artist and explain what permanent cosmetics you would like done. From there you will begin the procedure. It will be slightly painful, like a slow dragging on the skin. The dragging is done with a needle which applies the permanent cosmetics. The length of the procedure depends on what you are having done. After the procedure is finished your skin will look red and raw, but don’t worry because this is only temporary. Permanent cosmetics have some risks involved. Many recipients claim that the color is too dark, uneven or not what they expected. The permanent makeup artist will be able to adjust the color and evenness in most cases. It the area is large it can be challenging to correct it and removal may be the only solution. Some people may experience allergies to the pigments applied and the formation of scars. There may also be skin crackling, peeling and blistering. It is important to keep a close watch on the area so that it does not develop a local infection. A person may be totally dissatisfied with their permanent cosmetics which will lead to regret. It can be very difficult to remove in areas including the eyelids and lips without leaving permanent scarring. Immediately following the procedure the skin will appear red and swollen but that will go down within a few days. Follow any instructions that the permanent makeup artist gave you in order to keep the area clean and dry. Avoid the sun or tanning until your skin has healed. Most permanent cosmetics will appear much darker than expected when first applied. This is due to the color remaining in the outermost layers of the skin. This effect is temporary and the color will lighten within a few days. Permanent cosmetics will fade due to environmental and individual factors. The effects of the sun will lighten and fade the color. The amount of color and pigment deposited in to the dermal level can also affect the length of time that permanent cosmetics last. Natural looking permanent makeup will fade before more dramatic permanent makeup. If you notice fading or discoloration permanent cosmetics can be reapplied to get the full effect.